Fr Hunwicke's Mutual Enrichment: Pope Francis again, I'm afraid. Pope Francis again, I'm afraid. Like most readers, I rarely or never feel quite sure what our Holy Father actually means. Added to this is our natural inclination to treat with respect whatever a Roman Pontiff says (even when he speaks in a low Magisterial register). Accordingly, I am unwilling to join in the widespread criticisms of statements like his homily yesterday (Monday), in which he spoke about accepting new teaching, or 'surprises', from the Holy Spirit, 'new wine', and such things. But I will remind you of something which we know we are bound to believe because it is the dogmatic teaching of an Ecumenical Council (Vatican I), worded with clarity. so that, by his assistance, they might devoutly guard and faithfully set forth the revelation handed down through the Apostles, or in other words, the Deposit of the Faith." If Pope Francis, or any pope, were ever to teach contrary to that doctrinal statement, he would be teaching heresy. A pope is as subject to Catholic Doctrine as I am and you are. It is therefore the duty of each of us to gloss his words with such a hermeneutic as to be able to read them as being not contrary to what was taught by Vatican I.
Pope Francis says we mustn’t do things because “it’s always been done that way… habits must be renewed in the newness of the Spirit, in the surprises of God”. He’s made me understand that I’m in a rut so here’s a few (late) New Years Resolutions: I’ll stop going to Mass and Confession, and believing in Jesus. I’ll cancel my regular payments to the parish – I mean, “standing order!” it’s got repetitive, sinful obstinacy written all over it. I’ll stop boringly looking after my sick mother and I’ll stop going to work every day so I can buy food and pay my taxes. One good thing, though. The “wineskins” in my fridge never get much chance to get old so I’m in the clear there! Is that which Pope Francis is setting forth by way of his public teaching 'new teaching' or new revelation? While I agree we have a duty to gloss Francis words in the best possible light, to my mind we have a concomitant and equally grave duty to hold those words up to The Light in order to discern, for our own soul's sake, whether these teachings are consonant with the infallible teaching of the Catholic Church and the Sacred Scripture. I do not believe we must forsake all of our God-given spiritual and mental faculties in order to deny that which is obvious. I wonder if you, Father, or any other learned soul might be good enough to explain what "The Power of the Keys" (Matthew 16:19) might mean in respect of precisely what it is that a Pope might 'bind' and 'loose' on earth and in heaven. I find that not knowing what the Pope means is quite soothing. It's when his meaning is crystal clear that I get depressed. The teaching of the first Vatican council on this matter seems to me to be an extension of what St. Paul taught in the first chapter of his letter to the Galatians, which incidentally was the first thing that popped into my head when I saw Vatican Radio's quotation of the Holy Father's most recent remarks from the Domus Sanctae Martae. It seems to me that the pope is referring to custom, not tradition (if he was aiming his comments at tradionalists he should: a) Learn the distinction himself; b) Get to know traditionalists better). If he had begun by making the proper distinctions, perhaps the homily might not have been so controversial. However, he does seem to seize every opportunity he can to sow confusion and discord. Was he a middle child? How sad that so many Catholics are closed off to the fructive work of the Spirit.Why dont they become Orthodox? 'Closed off' v 'Fructive'? There is something that strikes me about that contrast that suggests to me a theological laxative is being called for. Speaking apropos of almost nothing except wineskins, I was amused many years ago when the first clergy ladies appeared here in the US and they promptly clapped themselves into Roman collars. Hmmm. Pope Francis speaks with clarity and precision when it is in regards to climate change. So, why can't he speak clearly on matters of Faith? The latter is intentional. I am not a child, and I will not pretend to be :unsure" of what he is saying. With all due respect to His Holiness, he has the capability to speak plainly at all times, and he often chooses not to do so. I toyed with the notion of sedevacantism for a while, and I fully agree it is not a logical position. Pope Francis's papacy has pushed me fully to Orthodoxy. I am also not here to pick fights or promote that choice. I'm simply dismayed by the cowardice of Catholic media, the vast majority of clerics and the laity to stand up and halt the madness. 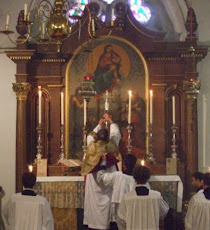 The "Spirit of Vatican II" dominates the Church now, and I see no place for myself here. I must credit Pope Francis with having driven me to re-educate myself on the fundamentals of Catholic dogma and the works of the Fathers of the Church, i.e. back to Denzinger, Ott, et. al. I also credit Francis' with expanding the width and breadth of my daily prayer intentions appended to my rosary, i.e. conversion of the Jews and Pagans, atheists, the Suffering Souls in Purgatory, the victims of abortion, homosexuals, etc. Were it not for Francis' clamorous silence on these matters I should not have been so keen to remember them specifically. Father, I agree that it is the duty of each of us to gloss his words with such a hermeneutic as to be able to read them as being not contrary to what was taught by Vatican I.
I regret to say that sometimes I find myself lacking in both intellect and knowledge to be able to do this. Though I do sincerely try. Learn to gloss by following the Pope's example. He is adept at glossolalia I believe. @Northeast Poster: are you saying that when Holy Mother Church needed you the most, you abandoned her? Because that's what you did, and that's who we are. Jan: 30: Beati Caroli Regis et Martyris??? Not all German bishops are bad! !